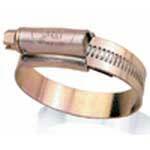 We offer superior quality MS Worm Drive Hose Clip that is manufactured with low carbon steel. This range of MS Worm Drive Hose Clips is offered keeping in view the existing market standards and requirements. The MS Worm Drive Hose Clips have attained the reputation of being the best in market and comes in reasonable rates.